Integral anatomy, with its whole body, layer by layer approach, stresses anatomical continuities and relationships previously overlooked or under described in regional presentations. 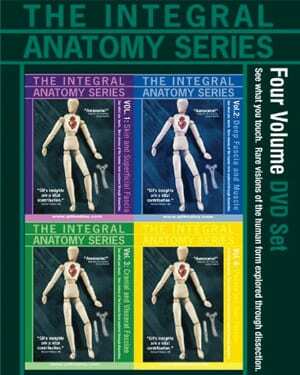 Integral anatomy is complementary to the essential and important study of regional anatomy. Both are needed and valuable, like different lenses in a professional camera bag, each capable of demonstrating a different perspective. 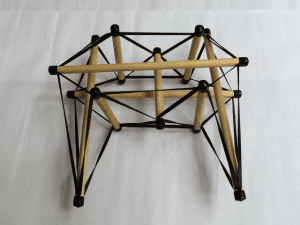 The visual proof and profoundly practical implications of this new approach can now be applied by professionals across a broad range of modalities. This series leads the viewer well beyond the boundaries of medical school anatomy and texts. The series is a must-have for any medical, allied or alternative health professional or student who wants their patient evaluations and treatments to be based upon a truly comprehensive knowledge of the human body. VOLUME ONE: running time 1hr. 40min, DVD. In what may be the most visually surprising and important sequences in the series, skin and superficial fascia are demonstrated as whole body layers in their superficial and deep projections. The layers are dissected on camera and presented in detail in their variations and in their implications for overall health. The visuals include a stunning off-body example from the male, and the entire superficial fascia of the female form is demonstrated off body as a singular layer and discussed in its wide ranging importance. This disk represents an important contribution to our understanding of these two most external layers of the human form. Only through a thorough familiarity with and understanding of these two layers can that which lay beneath them be truly comprehended. Anyone who wants to access the layers of deep fascia, muscle, viscera and bone must feel through these outer layers knowingly. Vol. 1 conveys that knowledge to the viewer. The material found on this disk is unique, cannot be found in books, and represents a leap beyond established regional perspectives. VOLUME TWO: running time: @1 hour, 50 min, DVD. In this volume the whole body continuities of deep fascia and muscle are demonstrated in detail and dissected on camera to demonstrate their relationships to underlying and overlying structures. Following through with themes initiated in the first volume, visual presentations and discussions of the practical implications for professional practice of the layer by layer demonstration of human form are carried deeper into the body. The first volume creates the material and visual context for understanding the layers explored in this volume. A comprehensive understanding of these deeper layers requires a thorough understanding of the more superficial ones. All are strongly encouraged to engage the material in Vol. 1 to achieve a full appreciation and understanding of Vol. 2. The material found on these disks is unique, cannot be found in books, and represents a leap beyond established regional perspectives. VOLUME THREE: running time: @1 hour, 53 min, DVD. This volume covers the fascial and membranous layers which surround the cranial and visceral spaces. You’ve heard of the dura, arachnoid, pia, endothoracic fascia, pleura, transversalis fascia, peritoneum, and pericardium. These layers are literally impossible to understand by looking at books or by hearing about them in classes, and are rarely demonstrated clearly even in the laboratory. Sequenced with the first two volumes, this stunning presentation plainly demonstrates these bag-like layers which define the spaces of our organs and central nervous tissues. The peritoneum is demonstrated in its entirety as perhaps never before in a spectacular on-camera dissection, the dura is revealed with its sinuses, healthy and pathological adhesions are explored and explained. Central to this presentation is the respiratory diaphragm, which cannot be understood apart from the serous membranes upon which it acts. Here it is demonstrated with absolute clarity in its continuity with the fascial and membranous layers of the viscera. These layers are integral structures of the human form, surrounding the major organs of the body. Their functions are plainly influenced directly by our touch and movement, and now a clear and simple vision of them can be added to your knowledge foundations. A comprehensive understanding of these deeper layers requires a thorough understanding of the more superficial ones. All are strongly encouraged to engage the material in Vols. 1 & 2 to achieve a full appreciation and understanding of Vol. 3. The material found on these disks is unique, cannot be found in books, and represents a leap beyond established regional perspectives. VOLUME FOUR: running time: @1 hour, 53 min, DVD. This volume covers the viscera of the abdominal, pelvic and thoracic spaces, and the fascia through which they relate. This volume also introduces into the mix of examples an unembalmed female form. The story of the layers of the form is continued where Vol. 3 left off, once the layers of the new form have been reflected in turn. The various organs are carefully explored at a pace coherent with the viscera themselves. The examples of the embalmed male and female form, whose viscera present clearly, create an ideal contrast to the unembalmed female form in which many adhesions are identified. The viewer is thus enabled to see both normal relationships and movements, as well as the sequelae to pathologies and surgeries. A comprehensive understanding of the viscera and their fascial relationships requires a thorough understanding of the layers which surround them and form their context. All are strongly encouraged to engage the material in the first three volumes to achieve a full appreciation and understanding of Vol. 4. The material found on these disks is unique, cannot be found in books, and represents a leap beyond established regional perspectives.